On Monday, April 14, 2014, the American Politics and Policy Program at the Asan Institute for Policy Studies hosted a roundtable discussion with Thomas Wuchte, head of the Action against Terrorism Unit within the Transnational Threats Department at the Organization for Security and Co-operation in Europe (OSCE). Mr. Wuchte delivered a presentation titled, “The OSCE and its Current Activities in Support of Regional Security Stability”. Mr. Thomas A. Wuchte took over as Head on Anti-Terrorism Issues in March 2012. His team, the Action against Terrorism Unit is part of the OSCE Transnational Threats Department (TNTD/ATU). Mr. Wuchte is a graduate of the United States Military Academy at West Point and received a post-graduate degree in International Relations and Russian Studies from the University of Illinois. He has extensive experience in government to government, non-governmental, academic and military multilateral co-operation throughout the OSCE region, as well as such regional organizations as the ASEAN Regional Forum (ARF), and the Organization of American States (OAS). 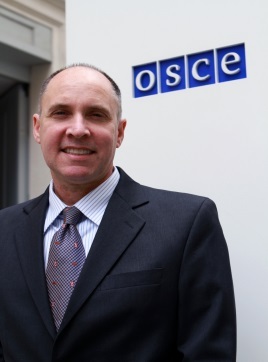 Before assuming his duties at the OSCE, Mr. Wuchte was the United States Special Coordinator for United Nations Security Council Resolution (UNSCR) 1540. UNSCR 1540 is a pillar of the UN Counterterrorism Strategy, established to reinforce rule of law, secure borders, and normative measures against terrorists – closely with police and customs. The position required co-ordination worldwide including with civil society to develop action plans, programs and frameworks to prevent and combat terrorism related to Weapons of Mass Destruction (WMD). Shortly before joining the OSCE, Mr. Wuchte received the U.S. Department of State’s Award for Excellence in International Security Affairs from Secretary of State Hillary Clinton for his efforts to work collaboratively with international partners. During his time at the OSCE, Mr. Wuchte has been working with its participating States and international partners on an inclusive approach across the OSCE’s three dimensions to countering terrorism, involving both the public and private sector, including businesses and civil society.